Cells responsible for hair growth, smooth and healthy skin, and strong nails tend to be very active and require a steady supply of nutrients. Many necessary nutrients may not be delivered to the body externally. What makes our product unique is the synergetic formula. Besides beneficial vitamins and minerals our product also contains Aloe Vera, N-Acetyl-Cysteine (non-animal source), MSM, Methionine, Rosemary Extract, Sage Extract, Fenugreek Extract and Horsetail Herb Extract (Silica). Biotin may be an important factor in normal hair growth according to some nutritionists. In addition, many multivitamins may not even have or have very little Biotin. 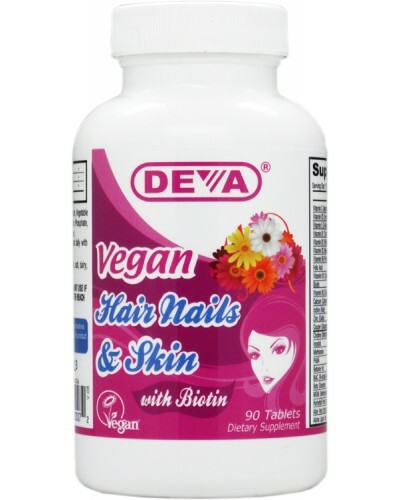 Our Vegan Hair Nails & Skin product has 500 mcg of Biotin (167% DV) per tablet*. DEVA Hair Nails & Skin Supplement is 100% animal free, and guaranteed for purity, freshness and labeled potency. Remember all DEVA Products are 100% vegan, vegetarian and are registered by the Vegan Society, the non-profit organization that actually invented the word "vegan". For adults, take one (1) or two (2) tablets daily, preferably with food, or as directed by a doctor.